Enjoy its quiet secluded tranquility on a hilltop on the Central Coast of California surrounded by oak trees and overlooking the Pismo Dunes and the Pacific Ocean. The spa is located in a rural area above and between Pismo Beach and Arroyo Grande California with mild coastal weather. Our spa is a totally green spa. The Mediterranean style 3500 Sq. Ft. house is was constructed so that every room except the garage laundry room and one bathroom have an ocean view. The 50 heated lap pool Jacuzzi and meditation garden are directly behind the house looking toward the ocean. The center below houses the therapy rooms complete fitness center walk in steam room loft and bathroom. Check-in is at 4 00 PM. Guests planning to arrive before or after this time must contact the property at least 48 hours prior to arrival to receive special check-in instructions. As a bed and breakfast property the Front Desk hours will vary guests should contact the property to find out more information. To contact the property use the number on the reservation confirmation received after booking. 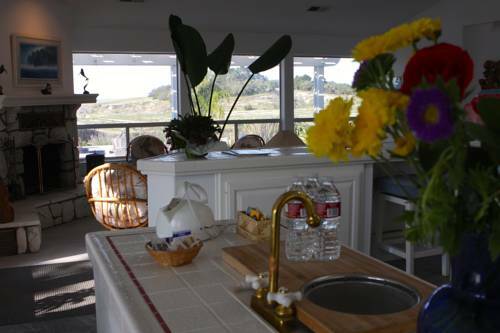 Enjoy its quiet secluded tranquility on a hilltop on the Central Coast of California surrounded by oak trees and overlooking the Pismo Dunes and the Pacific Ocean.